This is the Circa 1920 Gown posted here by The Old Fashioned Baby. Mimi loves to play dress up. I also ask you, faithful reader, for prayers for our baby mommy. She is quite ill and has been hospitalized for a week now. Hence the reason for my absence of late. I have been dividing my time between my daughter's home to help my son in law and the hospital. Enough about me. We all need her well, her baby needs her well and she misses her baby terribly. Sending prayers for the baby's mommy to be well very soon. The baby is beautiful in her special gown. Beautiful baby in a gorgeous gown! I hope and pray that your daughter gets well soon - I can't even imagine how hard it must be for her to be away from her precious baby! 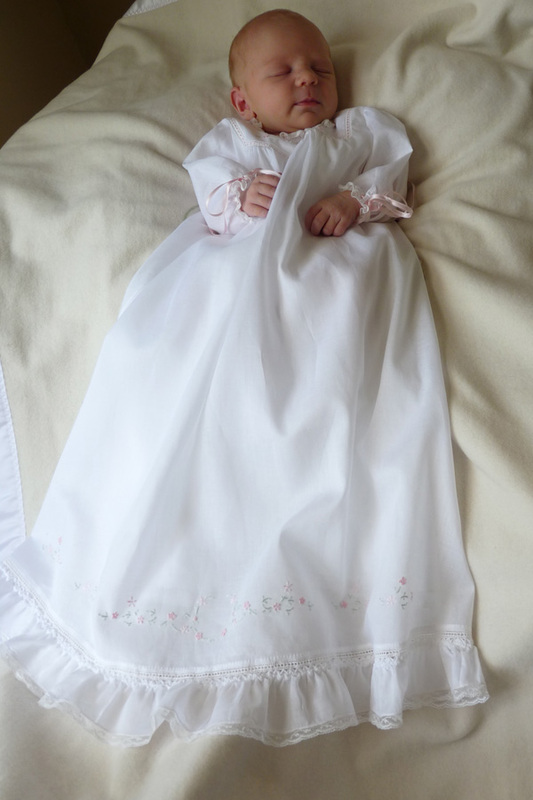 Beautiful gown on a beautiful baby. Prayers continue for Erin and you. I do hope Erin recovers from this dreadful illness soon. The baby is beautiful. And makes the gown look so nice!! 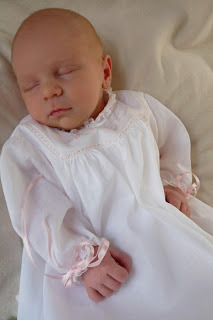 That precious baby looks all tuckered out from this most recent round of playing dress up! She and the gown are gorgeous, though. Many, many prayers for healing and strength for all of you. May this precious family be together again very soon. Prayers continue for a speedy recovery for Erin! Sweet Baby looks so beautiful in the lovely gown. she looks like a perfect little baby doll in that beautiful gown!! We are praying for Erin that she well be well soon and back to holding her swwet baby. My prayers are with you, Erin and the lovely baby. I hope she gets well and get back to her baby. 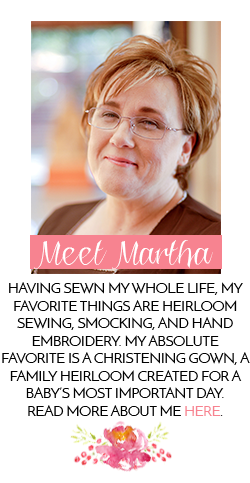 Martha.....the post partum timeframe is hard enough without being sick. Your entire family continues to be in my prayers!!! What an angel! Prayers for your daughter. What a blessing that you are there to help out. Take care, dear grandma. I know you are doing the best you can with all of this. Daily knee-mails being sent Heavenward on behalf of your whole family, Martha! This little angel & her beautiful Mommy need to be together, SOON! I hope you're taking good care of yourself while you care for others who need you. The baby is a doll! Will be praying for the mommy. Praying for your girl. In the meantime, play dress up and take lots of pics! EvaMarie is a beautiful little girl. I am praying that her Mom will be better soon so she can come home and enjoy her sweet baby. I'm sure your daughter is very glad to have her Mom there to help out, though! Your pictures are lovely; I always watch for your posts for more inspiration! Erin is constantly on my mind and in my prayers. In the meantime, have fun dressing that baby. * I wish I could hold her! Do you think she looks like her grandaddy? Love everything that adorns her beautiful self. Prayers continue for all of you.